Thermoelectric coolers (TEC) are solid state heat pumps that operate utilizing the Peltier effect. A thermoelectric cooler is used for cooling lasers, cooling electronics, and in medical device applications such as burning room cooling and physical therapy. CustomChill utilizes the thermoelectric cooler devices/modules in its chillers, taking this cooling technology to a new level to supply its customers with innovative products.The Peltier thermoelectric cooler effect occurs whenever DC current flows through junction of two dissimilar conductors. 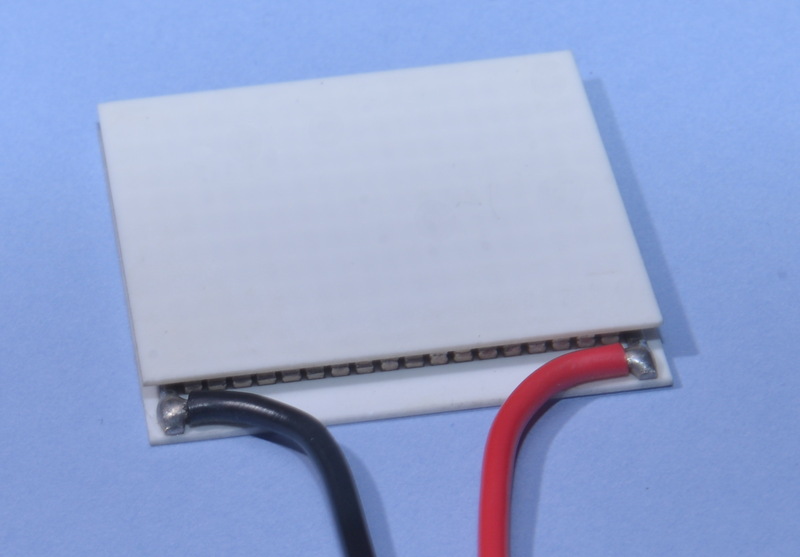 When current passes through a thermoelectric cooler, heat moves from one side of the ceramic plate to the other, creating a temperature difference between plates. When current is reversed in the thermoelectric cooler, the heat moves in the opposite direction, reversing the hot and cold sides. This Peltier effect is used in a wide variety of cooling or heating applications. A typical thermoelectric cooler is a semiconductor–based component, soldered between two ceramic plates, creating a sandwich type structure filled with bismuth telluride particles and doped to obtain N-P junctions. This thermoelectric cooler structure can achieve the maximum heat pumping performance. Advantages of Thermoelectric Coolers Thermoelectric coolers have limited amount of moving parts. For that reason, they offer high reliability and low maintenance over other types of cooling or heating devices. Thermoelectric coolers offer low noise performance and are ideal for use in medical offices, laboratories and all other places where noise reduction is a factor. Thermoelectric coolers are ecologically clean – no CFC, HCFC or even HFC types of refrigerants are involved in the process. In addition, a thermoelectric cooler is ideal for temperature control, allowing the system to maintain temperature accuracy of +/- 0.1 degrees Celsius. Another advantage of using a thermoelectric cooler is the easy to switch from cooling to heating by just reversing polarity of flowing DC current. In many applications this is extremely useful. CustomChill specializes in custom applications of thermoelectric cooler technology. CustomChill can work with you to help design your product to optimize the use of a thermoelectric cooler in your device. Contact CustomChill for further assistance with all your thermoelectric cooler needs.